247 sq.in. net free area. TOP: 27x27" Square, 4 - 4.5" Height. 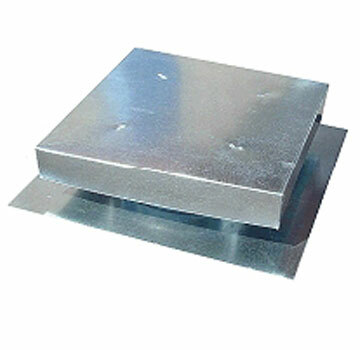 RISE FROM BASE: 3.5 - 4"
APPLICATIONS: Flat Top Roof Vents / Vent Caps are economical stationary roof ventilators designed for general relief and intake applications. The large hood provides good weather protection with unrestricted air flow. They are used as roof mounted ventilators, combustion air relief, or intake venting on residential, commercial or industrial buildings. CONSTRUCTION: Galvanized steel, sport welded for strength & durability, caulked for assurance against leakage. #4 mesh hardware cloth meets FHA requirements for protection against bird & insect passage. ADVANTAGES: Offer a low profile design combined with economy and versatility.